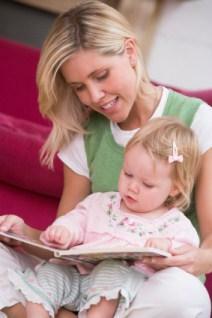 Picking out toddler story books is sometimes difficult for parents and daycare providers. Toddlers are sometimes finicky and often stubborn, so finding a book you can both agree on that also is age-appropriate can be a challenge. However, it is still important to make time to read with your children, even when they are active toddlers. Choose very short children's stories if your toddler has a short attention span. This way, she does not have to sit for very long to hear the entire story. Look for board books, which are sturdy for kids who are hard on their toys and books. Pick out interactive books, such as touch-and-feel books or lift-the-flap books, which keep toddlers engaged for a longer amount of time. Read books with lots of rhyming and simple words for toddlers to understand. Choose picture books that offer plenty of brightly colored illustrations to get toddlers' attention. Get into a reading routine with your child, such as a story before naptime and a story before bedtime. Finally, remember that even the most active toddlers can grow into book enthusiasts with a little patience and persistence. Allow your child to pick out the book can help foster independence in your toddler, as well as encourage reading. Even if she picks out the same toddler book about kites or toddler holiday book in the middle of summer, she is still interested in reading. Big Dog . . . Little Dog by P.D. Eastman follows two dogs as they learn about opposites. One Fish, Two Fish, Three, Four, Five Fish by Dr. Seuss is a board book based on Seuss's popular One Fish, Two Fish book that is perfect for toddlers. Chugga-Chugga Choo-Choo by Kevin Lewis is a fun rhyming story that hits the rails, perfect for any toddler who is fascinated by trains. Panda Bear, Panda Bear What Do You See? by Bill Martin is based on the Brown Bear book, but this version goes through the repetitive questions with animals in the wild. We're Going on a Bear Hunt by Michael Rosen follows a family's adventure on a bear hunt one day. Is Your Mama a Llama? by Deborah Guarino follows a young llama as he tries to determine who is each animal baby's mother. In addition to the individual books listed above, consider picking up some books in a series for youngsters around the toddler age. The Spot book series by Eric Hill features short stories that have lift-the-flap pages that are sure to keep kids interested. Also, the Clifford series by Norman Bridwell is another popular series for children to read. Look for story books for toddlers that also feature favorite characters from television shows and movies. Many books are available with Sesame Street, Dora, Max and Ruby and other beloved characters. Finally, pick up some award-winning books for kids, such as Caldecott medal winning books, that are sure to become favorites in your home. These books often stand the test of time and are excellent ways to build your child's library. Find more ideas for toddler story books in the LoveToKnow Children's Books slideshow Great Toddler Books.